Greenwillow Books (HarperCollins), 2019. 48 pages. 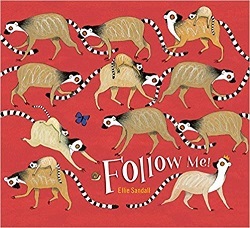 Here’s what I like about this picture book: You can use it in multiple ways. On the highest level, you can use it to teach children to tell time. There are “minutes” lined up around the tree like a clock. Diagrams in the back show what it looks like for all the multiples of 10 minutes up to 60. Twelve branches on the tree are positioned like the numbers on an analog clock. There are also some rain forest animals pictured. They are named at the back. You can also use this book to practice counting – all the way to 60. Or to count by tens. 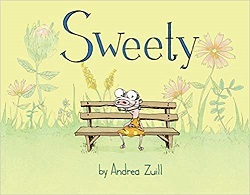 But I’ve got a Mother Goose Storytime for babies on Pi Day this year – and I think I’m going to use this book on the very simplest level – as words that are fun to say. It will introduce them to the idea of a clock while I’m at it. Chase me all the way around. 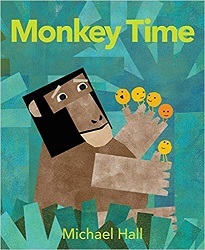 This clever little picture book reminds me of Chicka Chicka Boom Boom by personifying a concept and making a story with them that’s fun to say. A simple and fun way to introduce the concept of telling time. But there’s a problem when they try to carry it out. Because Gerald is always very careful – but Harold has trouble with that. And Piggie is always very carefree – but Hog has trouble with that. Their efforts in that direction are tremendously fun. Source: This review is based on an Advance Reader Copy I picked up at ALA Midwinter Meeting. Chronicle Books, San Francisco, 2016. 32 pages. Flora’s back! She’s dancing with a new kind of bird – this time not one, but two peacocks! Flora looks a little more sophisticated this time, with flowers in her hair and holding a fan. She’s still got her child-sized round body shape. Again, Flora dances with the birds, using the fan to mirror the peacocks’ tails. 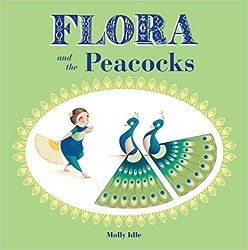 Besides the beauty of the illustrations, the fun and motion of the flaps, and the way the child and birds mirror each other’s movements, Molly Idle always puts in a surprising amount of story in her books, even without words. In this case, the fact that there are two birds means that a rivalry springs up. Jealousy threatens to destroy the dance – but then they come together in the biggest fold-out section of all. Will the book and the huge fold-out hold up to library usage? That remains to be seen. It also makes me think it would be difficult to use in a storytime. But one on one, or with a few children at a time, I can easily imagine children reading this book again and again, enjoying the beauty and telling you all they notice about the characters, the feelings involved, and the ultimate happy ending. Without printed words, children will take pride in reading this book long before they can decode print. And what a wonderful way to introduce them to story with a beginning, a middle, and an end. A Neal Porter Book (Roaring Brook Press), 2016. 40 pages. 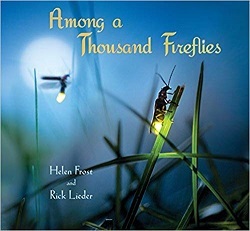 Here’s a quiet book about friendship. 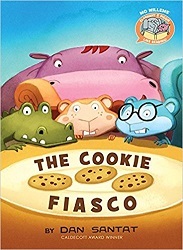 This isn’t an action book for keeping a class distracted, but a cozy book to look at closely and share in a lap or with a friend. The beautiful paintings add to the experience, though the scenes don’t change a lot – dandelions or snow. Samson the wooly mammoth tends his dandelion patch on sunny days, hoping for a friend to come along. One day, a little red bird comes and takes some flowers for her friend, who is having a bad day. The friend’s favorite color is yellow. After the bird flies away, Samson falls asleep. While he is sleeping, the weather changes, and everything gets covered with snow. 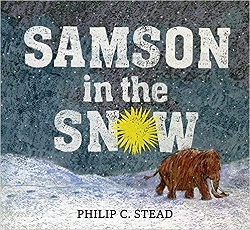 When Samson sees everything all covered with snow, he worries about the little red bird, and sets off to look for her. As he walks around, he finds a little mouse. The mouse is having a bad day, but is looking for his friend. She is small like him, and he’s worried that she’s covered up by the snow. The mouse gets warm in Samson’s wooly fur, and together they keep searching. Samson sees something yellow, and it turns out the mouse’s favorite color is yellow, too. When Samson goes to the yellow spot, it turns out to be the little red bird, very cold in the snow. Samson takes the mouse and the bird to a warm cave and they all recover and talk about their adventures in the snow. If it seems a little unlikely that Samson would find the bird’s friend on his walk, well, I like the way it’s left to the reader to figure that out. We see friends caring for each other and Samson, who was waiting for a friend, finds two. Groundwood Books, 2016. 32 pages. 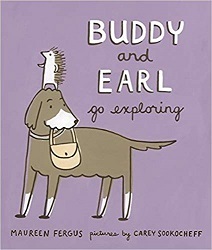 Buddy and Earl Go Exploring is a picture book in the grand tradition of animals-don’t-understand-human-things-with-hilarious-results such as Minerva Louise, The Adventures of Cow, and Paul Meets Bernadette. The child hearing this story will delight in being smarter than the animals. In this case, we have a dog named Buddy, who is a little more savvy about human things, and an adventurous hedgehog named Earl. Earl is new to the family. One night, Earl announces he’s going on a trip and travels for some time on his hamster wheel. After a long time, he stopped and looked around. “This place looks eerily similar to the place I just left,” whispered Earl. “Maybe that is because it is the place you just left,” whispered Buddy. When he heard Buddy’s voice, Earl was so startled that he jumped and made a funny popping sound. “I am not sure,” said Buddy uncertainly. As they explore this place (the kitchen), first Earl sees a silvery lake in the shadow of a great mountain. Buddy knows it’s his water dish in the shadow of the garbage pail, but he gets carried away in Earl’s enthusiasm. When he knocks over the garbage can, at first he feels terrible. Then he noticed some of yesterday’s meatloaf and forgot all about feeling terrible. Next, Earl sees a lovely lady hedgehog trapped in the jaws of a monster. Buddy knows it’s Mom’s hairbrush in her purse, but soon is convinced to help Earl save his friend. Then they have an encounter with the vacuum cleaner before settling down for the night. The last picture shows the two happily asleep – with the results of their exploring strewn all around the kitchen, and Dad’s foot coming into the kitchen the next morning. The story is simple enough, but the characters make it wonderful – with Earl’s wild imagination, and Buddy’s simple friendly doggy enthusiasm. 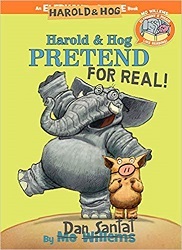 Kids will enjoy being in the know and delight in the good-hearted adventures of these two friends. It’s a simple, silly story. You don’t need to talk about the math behind it at all. But someday, when a child is learning to divide three by four, you can use this as a lovely illustration. And similar fractions. There’s even room for talking about common denominators. 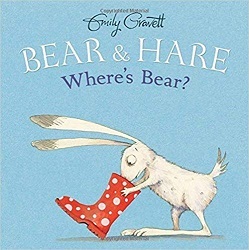 I’d love for this book to get a mention in the next set of Mathical Awards, I liked it so much. You are currently browsing the archives for the Animal Characters category.